Before Marvel MAX allowed their mainstream heroes, such as the Punisher, to curse and get real violent writers had to go shift key crazy to produce real world dialog that fit the tone of certain comic books. In 1993's Punisher #75 the writing team best now known for bringing back great cosmic story telling, Dan Abnett and Andy Lanning, produced a very standard Punisher tale of destruction and heroic vigilantism. You can tell the writers of British because their symbols used in their curse words include the British "pound" symbol. I don't think the "pound" symbol is often used in curse references. Maybe the character was supposed to have an English accent. That sounds right. The cover of the comic of the day is both very plain and very memorable. 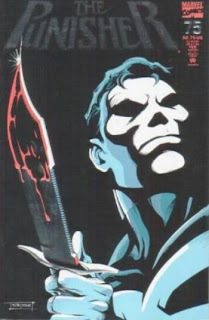 The Punisher #75 has a close up of the Punisher as he is holding a bloody knife (the Punisher only uses a knife once in the issue to cut a rope...he hates ropes), and standing in darkness with a bit of light on him. His face features resemble his skull face logo on his chest, and his knife has a slight sparkle on it's tip. Just the tip! Oh, and the issue is embossed. Bam! Instant classic! In the 90's all you had to do to make a comic book worth an extra dollar was create a cover that popped out in some way. Also, throw in some silver foiling for that extra special deception. Often times these issues were the anniversary or special numerical mark issue. They always sucked. Web of Spider-Man #100... case and point. The Punisher #75 unfortunately fell victim to the special addition issue curse and no amount of British "pound" symbols, foil coating or face skullery could save it.